Shuffle board is a game that has long been a near exclusive to local pubs and the occasional enthusiasts home. We’ve found that it’s a great, easy-to-learn, challenging-to-master, all ages activity that can be added to just about any event. The premise is simple, you take turns competing against another player to see who can slide their pieces(weights) further without having them fall off the edges of the board. 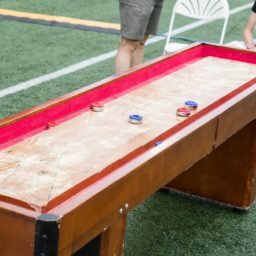 Opponents peices can legally be knocked off the end or sides of the shuffleboard scoring area to prevent your competitor from scoring. The game is typically played to 15 or 21 points, players choice. To include more players, you can partner up with a friend or coworker, and take turns, on opposite sides of the table, each with an opponent on your side. The mechanics of shuffleboard are what make it so challenging. The table is lightly sprinkled with special sand that helps to reduce the friction between the weight and the table. Getting the correct amount of force applied to the weight to move it most of the way down the board, without it falling off the edge, is more challenging than it first appears. Despite it’s challenge, children can just as easily participate, making this the perfect activity for any occasion. 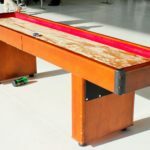 While having a beer or mixed drink in your hand can certainly make this game enjoyable, shuffleboard is still a great rental for any occasion. 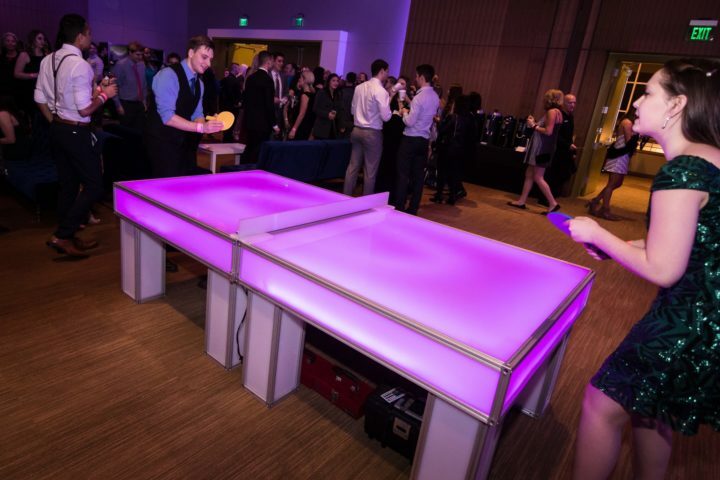 We’ve brought this popular event activity to corporate events, holiday parties, graduation nights, youth group events, and so much more. 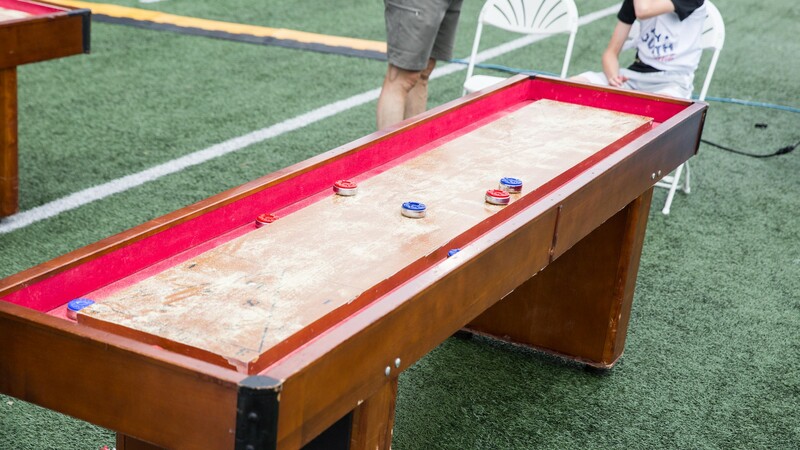 Bringing a shuffleboard table to an event doesn’t require anything too special. 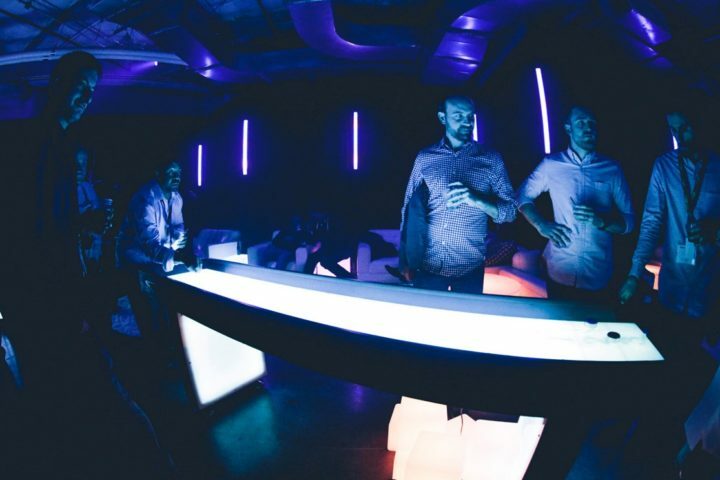 No power is required for the table to work correctly (unless you rent the LED version!). The table can be loaded in through any normal door, there just cannot be any narrow hallways with sharp turns between load-in location and it’s final destination. As with all of our table game rentals, we provide extra game peices, and extra sand, to insure interruption free play throughout the evening. 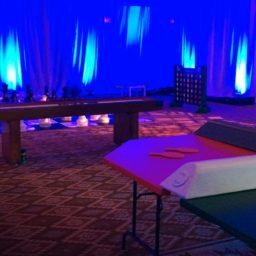 If you are creating a larger game or arcade area at your event, you might consider hiring a game area manager, to make sure games are always stocked and reset correctly for the next event attendee.